Refreshing Daily in God's Word: Daily Devotion: Did You Know About Columbus’ Findings? 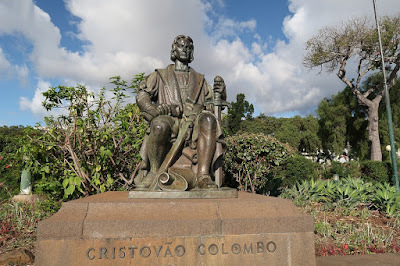 Daily Devotion: Did You Know About Columbus’ Findings? Much has been gleaned about Columbus’ voyages from Bartolome’ de las Casas, the 16th-century priest who chronicled Spanish exploration. He told the world about hammocks (“very restful to sleep in”) and tobacco. But it was the admiral himself who recorded the most vivid impressions of his surroundings on these shores so far from home. “Here the fishes are so unlike ours that it is marvelous,” Columbus wrote. “And all the trees…as different from ours as day from night, and so the fruits, the herbage, the rocks, and all things.” His descriptions set European naturalists aquiver. Among his discoveries was the delicious “pine of the Indies” – the pineapple. It is wonderful that there are those who have come upon so many of God’s wonderful creations; but the greatest find of all is to find God, to come to know the Lord Jesus as one’s personal Savior. To God be the glory for that great “find” in my life. ✞If you have found Jesus as your Savior, you have found the greatest gift of all! Have you found Him?